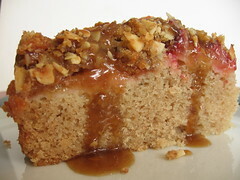 Spiced Plum Streusel Cake with Toffee Glaze - Do You Know The Muffin Man? 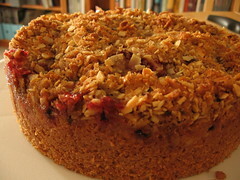 Notes: A nice easy cake spiced up with cardamom and cinnamon, both in the streusel and in the batter. The plums are covered completely so their liquid is absorbed by the topping. The toffee glaze is just brown sugar, butter, cream and vanilla and takes 5 minutes to make. It went pretty fast at work, but I thought it was just so-so.